A lighthouse that serves as a secret transit station to another realm. A scene in which the protagonist (un)willingly murders his father-double. So far, so good. But I couldn't help noticing that there were a few nonequivalent elements that stood out. 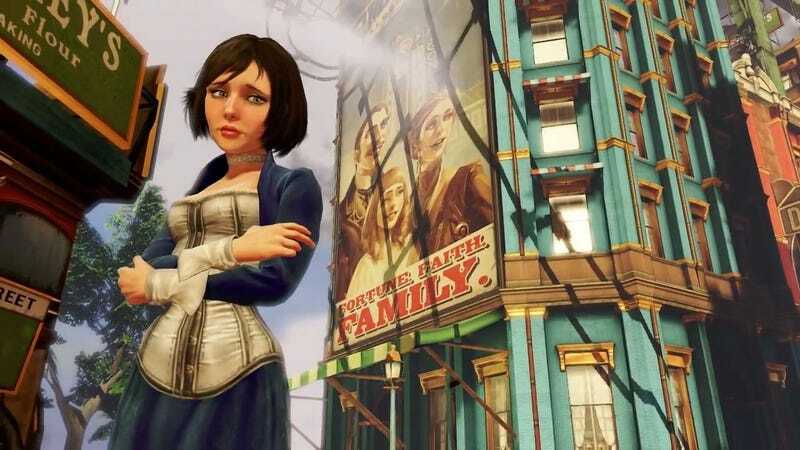 Lady Comstock, for example, is one of the characters who doesn't have a Rapture double. (Ryan has mistresses and girlfriends that we hear about, but none of them appear in the game.) She's actually pretty mysterious, since we never find anything about her personal life or background pre-Comstock; when Elizabeth brings her "back to life," she's just a sort of vague embodiment of malice and regret, literally a hole ripped in the fabric of reality. Also, the vigors don't have the addictive/degenerative quality of the plasmids in Bioshock; indeed, they don't seem to have any biological component at all, and their existence is never fully explained. And where Fontaine ended up being the same as the revolutionary who was opposed to his work, Fink ends up being murdered by his opponent (although "Fitzroy" also begins with an "F"). At any rate, I'm very interested in seeing where the series goes from here. I can't help but wonder what sort of environments and characters will figure in a sequel. Anybody spot any other parallels or inconsistencies between the two games?